In 2017, you made a difference in the lives of children and expectant mothers in our care. 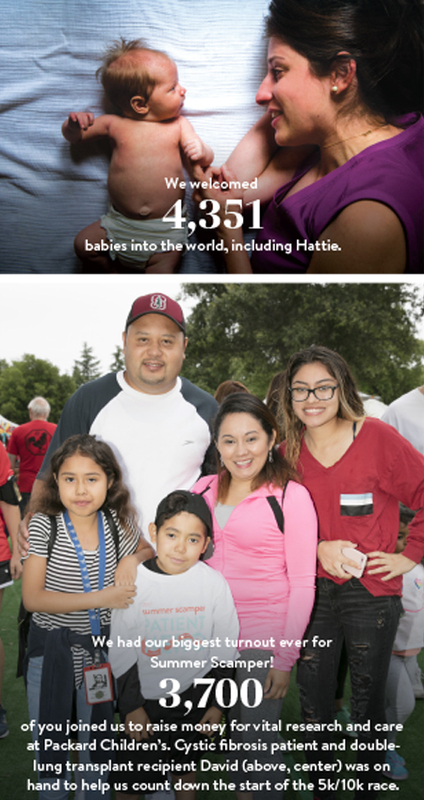 More than 16,500 donors like you collectively gave more than $163 million to sustain clinical care, accelerate research toward new treatments and cures, and ensure that no local family in need of care is turned away due to their financial situation. From hosting dance marathons to supporting Summer Scamper-ers, you showed our patients and their families how much you care. We couldn’t have done any of this without you. From all of us at Lucile Packard Children’s Hospital Stanford and the pediatric and obstetric programs at Stanford University School of Medicine …THANK YOU! Gifts made between September 1, 2016, and August 31, 2017. This article originally appeared in the Spring 2018 issue of Packard Children’s News.